Merry Christmas, Happy New Year, and Happy Valentine's Day! I've enjoyed my blogging break so much but decided I'd better get back over here before everyone forgot who I was. I've really missed seeing everyone's wonderful creations while I was gone and will get by your blog as soon as possible. Christmas was nice ( and way too LONG), New Years is almost here, and Valentine's Day is right around the corner. I know this card is beyond being clean and simple but I just had to do something with this image to show how cute it was. At least it'll be a very easy card to mail! I just haven't had a whole lot of time with company coming and going and basically just being a total bum! This image (pre-colored) is from Deedee's Digi's. In case you missed the news, Deedee's Digis is closing it's shop. So sad and I also understand that other shops are having to close too. All this is due to some type of new European tax law. However, the good news is that Deedee's Digis will be open until around the end of January AND if you create a card using a Deedee's image and enter the challenge this month you will receive a $10.00 gift code to the shop!!! WooHoo! You can stock up on all those cute digi's she has!! That's all there is to it! Create the card and received a $10.00 gift code! Also........all who enter will be entered into a drawing for a $50.00 gift code to the shop! Can't get any better than that for sure. Check it out! Christmas is a time for so many things - including family and friends. It's also time for hubby in my house! I think Jim is a little tired of seeing my rear end sitting at the computer or craft desk all day long so I'm going to be taking a short break for the next week or so from posting, commenting, and even a little of the computer. I may even have to re-introduce myself to him! Of course after a while he's probably going to tell me to get back on the computer and back to card making! LOL! My first card was completed with a Hero Arts image and SU sentiment - all embossed in gold. The second one card shows another one of those cute, cute images from Deedee's Digi's! Be sure and check out Deedee's for not only the wonderful images but also for the progression challenge that is going on this month. Hope everyone has a wonderful holiday and Christmas. I'll be back before you know it and you may not even know I'm missing. Thanks for stopping by.........and Merry Christmas! Scrapy Land Challenges starts again today and we'd love to see your creation using a brand of die that Scrapy Land carries. Our theme this time is Holidays! Enter our challenge for a chance to win a wonderful prize from the Scrapy Land store. Be sure and see all the inspiration from the DT. 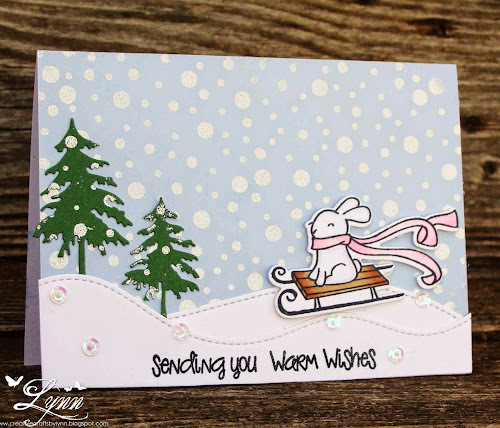 I created another clean and simple card today using the Frostyville die from Memory Box. The sentiment from Hero Arts was embossed in white and then several shiny sequins added. All of this was placed on some Night of Navy card stock. Santa is coming........but left his clothes behind because it's too warm in this part of the country. He's in his Speedo instead!!!! WooHoo!!! I'm looking for Santa! I was scooting around in blog-land the other day and saw this image on Chrissy's blog. Eeek!!!!! I had to have it! She made such a cute, cute card using this. The image can be found at From the Heart Stamps where they have a monthly progressive challenge. This almost looks like me when I start the wrapping - almost! First thing I do is slap on the reindeer horns.... might as well get in a good humor for that job...then turn on the Christmas music. I usually have a cup of "something".....like a nice cold bottle of beer! I always try to carry more wrapping paper than I can handle and it goes rolling across the floor - along with ribbon, bows, tape, and everything else......Rambo grabs one of the ribbon rolls and high tails it to the other end of the house. (Are you starting to see why I need the beer!) I finally get it all settled on the table and am ready for this fun job. Jim walks in and says he wants to help - and I grab another beer! Finally, everything is wrapped, tagged, and ready to go. By this time I really don't even care what they look like and probably had enough beer too! That's really how I do the wrapping every year! Such fun! 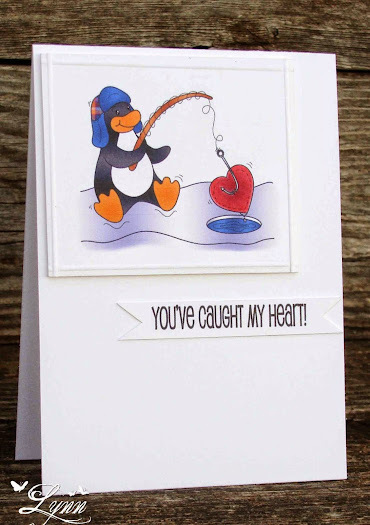 I'll enter this in the progressive challenge at From the Heart Stamps. I'm not sure if it's my camera, the computer, or the person taking the pictures (surely not!!!!) but I can't seem to get a good picture using pink and the red is looking like a runaway firetruck! Whew! This is so RED, it almost puts your eyes out and even looks blurry! Do I need to get my eyes checked again or is everyone else seeing what I see - and if so, what's the solution! I've been trying to tone it down but the reds just jump off the page. Anyway.........enough on colors! The challenge starting today at Tuesday Throwdown is themed Christmas-Famly. We're being sponsored by Stamping Boutique who also provided the DT with images. Be sure and enter the challenge for your chance to win a wonderful prize package from our sponsor. I used the image Mail Girl, coloring her in Copics and then sponging in some blue for the sky behind her. I really, really, REALLY would love a coat like she's wearing but there's just no need in spending the money on something that warm in this part of the country. I'd probably have a heat stoke - but it really does look snuggly and I'd at least look good having the heat stroke! Be sure and check out Tuesday Throwdown.....and thanks for stopping by! I'm sure by now everyone has seen the mess on Blogger with the word verification! I saw mine early this morning and went over to Blogger Help to find out what to do. They did leave a reply to my question on why it was being so screwy but I swear I'd have to have a degree in computer technology to figure out what they were even saying! If I could figure that out I would NOT have a blog - I'd be teaching a computer class instead! They were talking about cookies and filters! Now come on......cookies are to eat and the only filters I'm familiar with are coffee filters!!! Thanks to some ladies in one my design team groups, here's the latest! You can change the setting to "embedded" - however, you may get some spam comments. (Spam comes in a can and you're suppose to eat it - however, I'm not a fan) I personally don't want to have to deal with the spam either on my blog or in the can. BUT, there's a way around all this.........when the word verification comes up, don't even attempt to try to read what it says for you to type (who can see that anyway)! All you have to do is leave your comment and then hit "Publish"! It will publish just fine...........at least until they change something else up. 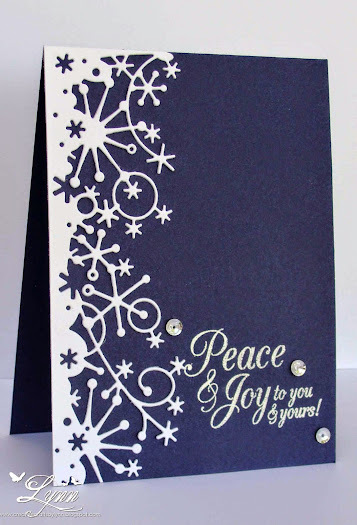 Another challenge starts over at Squigglefly today and our theme this time is to use Die Cuts or Embossing. The image I'm using is a new release called 5 Cent Stockings by Sandra Caldwell and can be found in the Squigglefly shop. The stockings have been printed out twice, popped up on dimensionals, and colored with Copics. 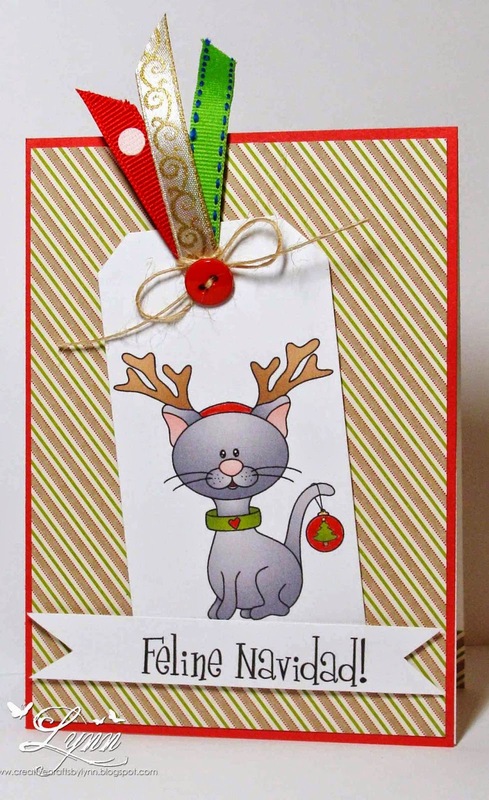 This was mounted on some Christmas-y patterned paper with the ribbon and die cut (from Impression Obsession) added. 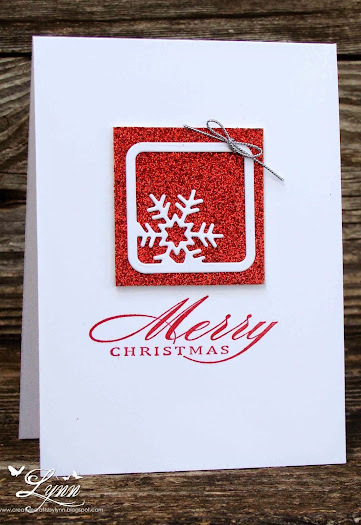 A sequin and red gem were added to the center of the snowflake. Be sure and head on over to the Squigglefly challenge and enter for your chance to win a wonderful prize package. Anyone can play along but to be eligible for the prize you must use a Squigglefly image. If you go over to Deedee's Digi's shop you'll find this precious little deer. Look at the smile!!! What more could you ask for - cute deer, small sentiment, and a bit of gold cording! A CAS card that was quick and easy to do. 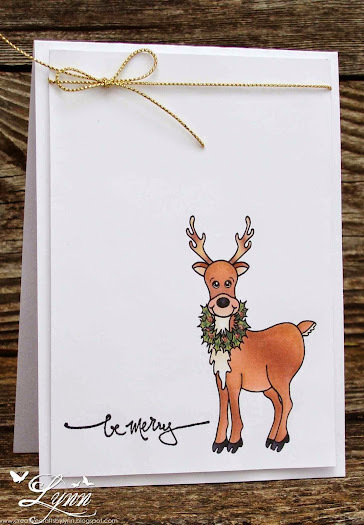 Everyone is in the Christmas card crunch right now and this would make such a cute card for anyone. While you're over in that direction be sure and check out Deedee's Digi's challenge blog too. It's a progressive challenge (you can find all the rules on the blog) and we'd love for you to play along. This is a pre-colored image that I also used some Copics on for shading. Some Wink of Stella clear was added to the wreath around his neck to give him a little sparkle and the sentiment is from SU. This set, called Deer Friends, also comes with some wonderful sentiments and the image is in line version or pre-colored. 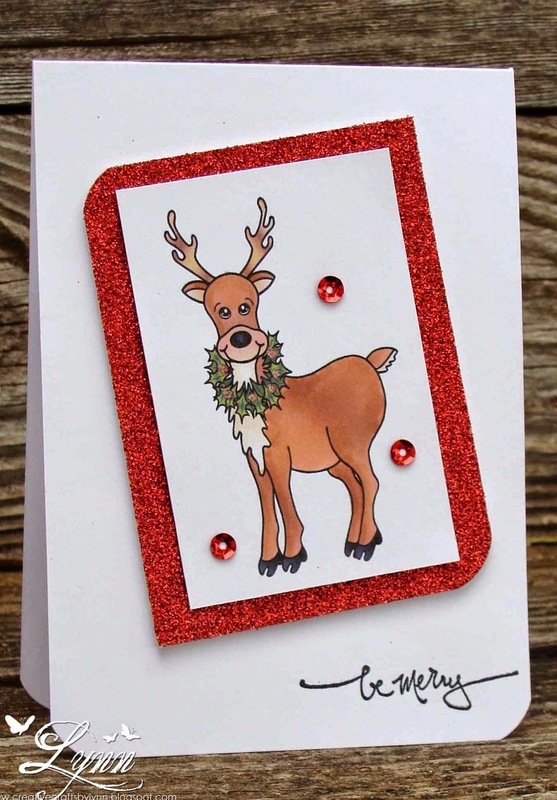 Since I'd already printed him out once, thought I'd do it again and make another card with some of the left over red glitter paper that I've been using. I think maybe this is the very last piece of that paper. Two very simple cards that are now ready for mailing! Also..........before I forget! A very sweet blogger by the name of Chriss is having some blog candy right now. She's asked that I mention this on my blog so you can go over and take a look. 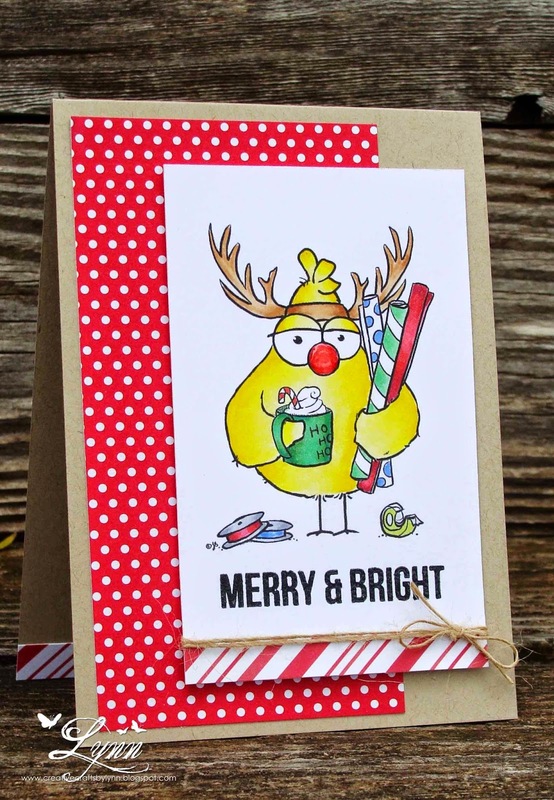 Her blog is called Scrappin with Chriss and Lou and she always make fantastic creations. Chriss is taking off from blogging until the end of December but you still have time to enter for the blog candy if you wish. It's coming down to the wire around here. Christmas is right around the corner now so it's time for some of my famous Git 'Er Done cards! Quick, easy (well, it would be easy if I could learn how to stamp straight! ), and glittery. You're going to be seeing several git 'er done cards for the next couple of weeks here. I used a framed snowflake die from Simon Says Stamp and backed it with some red glitter paper. The sentiment is from Hero Arts and I tied a tiny bit of silver cording in the corner. What more can I say except I have another Christmas card completed. 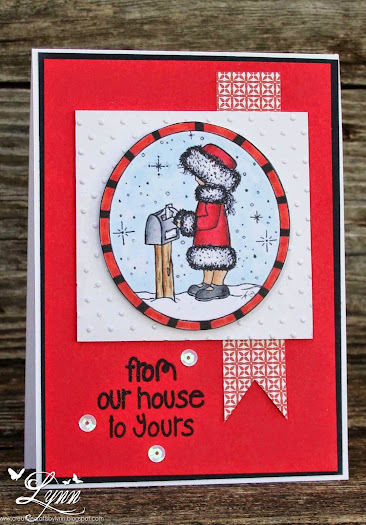 I'll enter this in the challenges at Addicted to Stamps and More (CAS), Cuttlebug Mania (since I used my trusty Cuttlebug to cut out the die) (Snowflake and a Sentiment), and Crafting When We Can (CAS). Dashing through with the Scrapy Land Challenge! Our theme this time is Anything Goes. 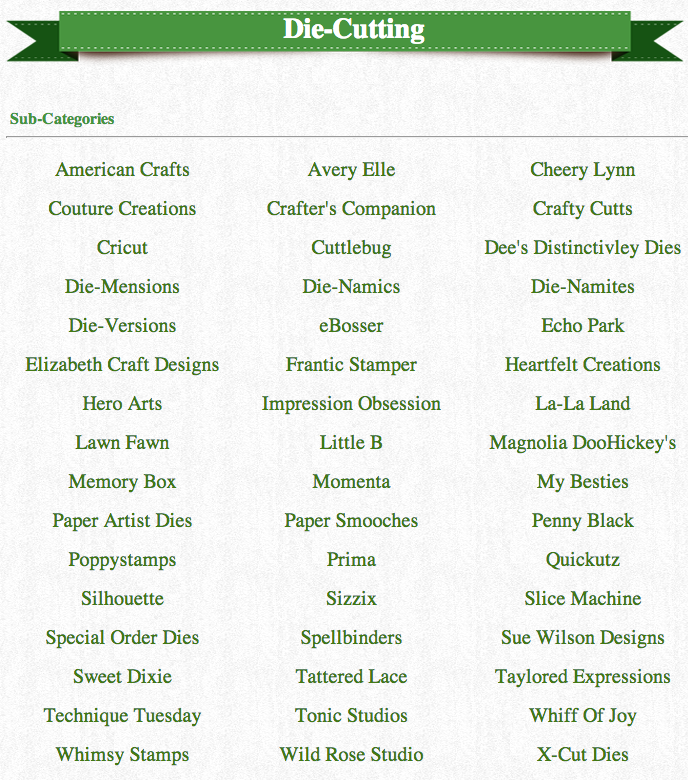 Be sure and enter for a chance to win a wonderful prize from Scrapy Land. Just remember you must use at least one of the brands of dies that are sold in the store. 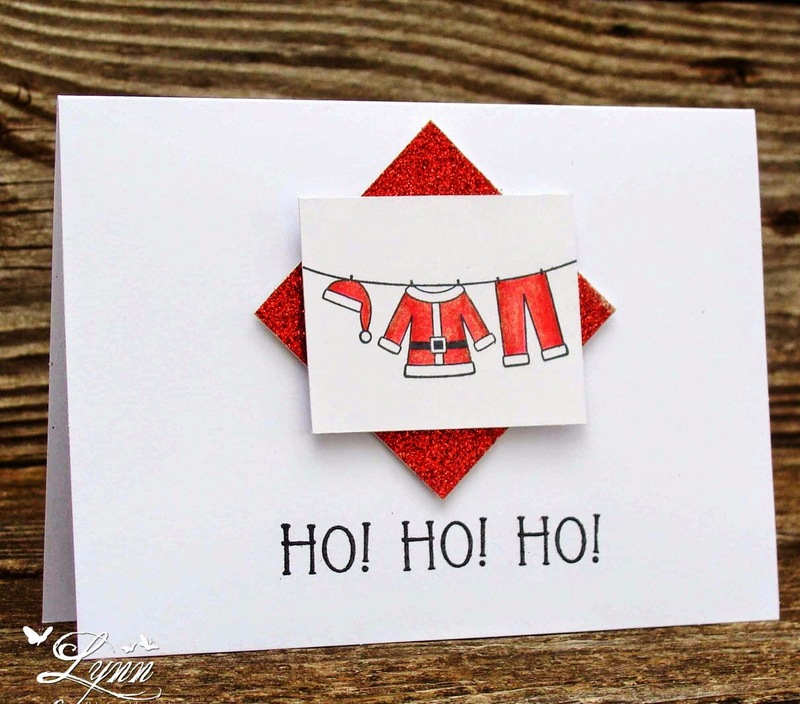 It's December so it's time for the Christmas card frenzy to hit! I'm just now finishing up mine and hope to get them out soon. The goal was to do that this week, but don't think it's going to happen. I'm just shooting for sometime before January 1st! On to this one though.... The light blue background was stamped with The Alley Way spots background stamp in Versamark and then heat embossed with white. It looks more like a HUGE BLIZZARD with those big dots! 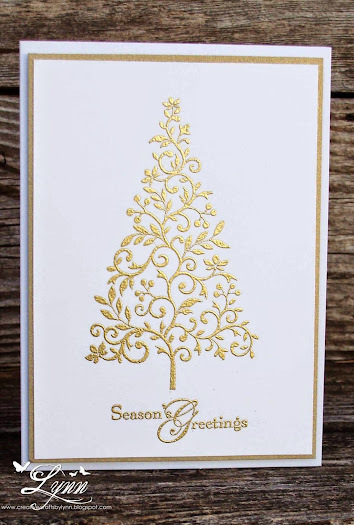 I probably should have gone with a stencil or embossing folder instead - but didn't, so it is what it is! The trees, Evergreen, are from Impression Obsession. I stamped some of the "snow" on them also. The cute Winter Bunny (Lawn Fawn) was stamped and cut out with the matching die. He's popped up on the Stitched Hillside Borders - also from Lawn Fawn. Finishing up the card I stamped the sentiment from Stamps of Life and added the sequins. Thanks for stopping by.......and head on over to Scrapy Land Challenges to see all the inspiration from the Design Team.